Hewitt Cantilever Lifts have a long history of trouble-free performance. They require few moving parts for superior reliability & place less stress on pulleys & cables. 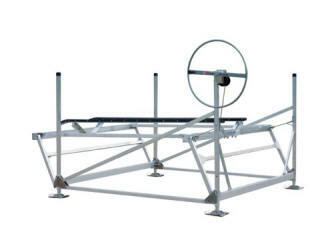 In the lift's fully raised position, cables carry no weight, the load is entirely supported by the frame. Corrosion resistant aluminum constructions also assures low maintenance -- no rust, no painting. Standard Cantilever Lifts include self-adjusting cradles & keel protectors, manual winch & rubber end caps. Deluxe rubber cradles & keel protectors are available as options. Capacities range from 1200 to 4800 lbs. These cantilever lifts are solidly built & heavily reinforced for today's extra wide, extra long craft. They are also an ideal lift for larger pontoon boats, with interior frame dimensions up to 115". 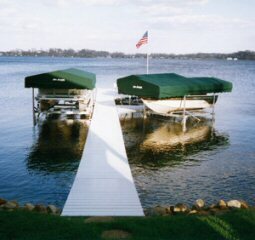 A variety of pontoon cradle kits can be installed in place of the standard boat cradles. 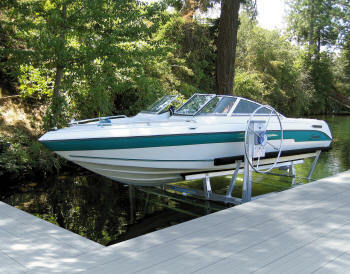 Options include wood & adjustable aluminum rack kits that lift under the pontoon's deck & serve as positioning guides. 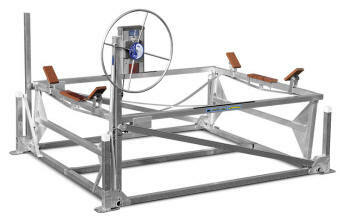 There are also 2 styles designed to cradle the pontoons: an adjustable aluminum model & a wood "V" bed covered with marine carpeting for full length protection. Cantilever lifts work best in applications where there is very little water fluctuation. Cantilever lifts use only 1 cable & have fewer moving parts than vertical lifts. This keep the cost of cantilever lifts lower than comparable vertical lifts.